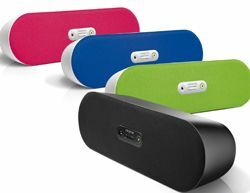 Creative's Bluetooth speakers offer multiroom solution | What Hi-Fi? Creative has launched a modular wireless system that allows its new ZiiSound speakers to work separately or as part of a cinema or multiroom system. Also new are a range of Bluetooth speakers, some with aptX support, a budget Bluetooth speaker and a nano-sized media player (again with Bluetooth). There are two new speakers in the wireless multiroom system, the ZiiSound D5x and smaller D3x, and a new subwoofer, the DSx. All the new speakers work over Bluetooth, and are also aptX compatible if you have a suitable device or dongle. The new modular system allows for a 1.0, 1.1, 2.0, 2.1 or 3.1 system, using multiple speakers and the sub, or a basic multiroom system with speakers in different rooms. While your music is sent over Bluetooth, the speakers then form their own wireless network from one 'master' speaker to the other 'slaves'. The Creative ZiiSound D5x will go on sale in June for £280 along with the DSx subwoofer, yours for £140. The D3x is due in August for £140. Another new Bluetooth speaker was also announced, the D80 (pictured). Available in a range of bright colours and costing just £40, it is no doubt aimed at partnering the new ZEN Style M300 media player. Also available in a range of eye-catching hues, the M300 is a nano-sized portable with integrated Bluetooth for streaming music. There are three new sets of headphones, the WP-450, WP-350 and WP-250. Costing £120, £90 and £60 respectively, all three are Bluetooth compatible with integrated mics for voice calls, with the two premium models also supporting aptX.